The Views module is one of the best things to have happened to Drupal. Views provides an easy way for any Drupal site designers to present how lists and tables of content. Views has a smart query builder that can build the proper query, execute it, and display the results. In this article we will tell you how to programmatically add, embed or insert Views in your theme's tpl. This function is meant to be called from PHP snippets to embed a view in a Drupal node. It has two parameters: $name - The name of the view to embed and $display_id - The display id to embed. Consider this example below. 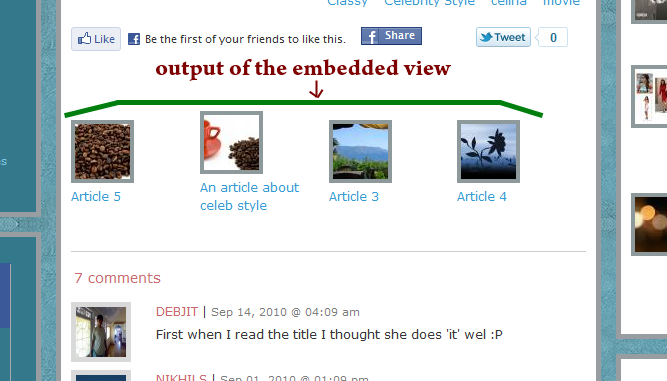 We are embedding a view for displaying related articles after the article content type. For this we embed a view called Relatedarticles in our theme's node-article.tpl.php file. The snippet above shows a variable $display_id which is set to block_2. The illustration below shows how to find out the value for $display_id corresponding to the Display of the view that you want to embed in your website, progammatically.